I AM SO EXCITED!!!!! 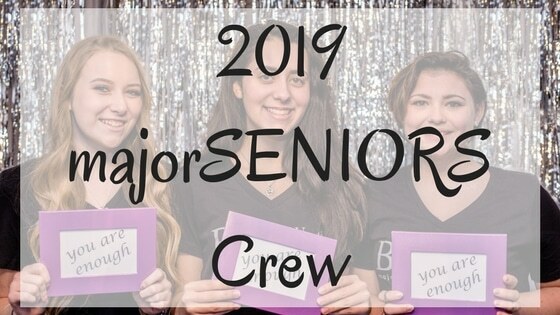 It’s time to release my 2019 majorSENIORS Crew applications! Well, almost. They go LIVE October 1 and will close October 31. EEEEKKKKK!!! Senior Pictures are my passion and I LOVE meeting and getting to know all of the wonderful young people that grace my camera with their presence. The class of 2018 brought me the 3 beautiful ladies you will see in this blog. I can not speak enough of them and their beauty, inside and outside. So what is the majorSENIORS Crew? I have a dream to create a family that has nothing to do with DNA, for high school junior and seniors; a crew of people to support, care about and encourage other’s in the crew. A place to be yourself and not be judged by others. Girls are tough on each other and we grow up to be woman who are tough on each other. We need to build each other up, not tear each other down. Growing up, I was the leader of the pack, but i always felt alone. I never felt pretty and felt like i wasn’t good enough. If I can help just one girl to not feel that way anymore, the majorSENIORS Crew will be a success. The mSC (majorSENIORS Crew) is a group of 2019 Seniors that will represent my business from December 2017- graduation. This year’s Crew has had more than 6 sessions and it’s only September. You’ll get free digital images from these sessions and chances to earn more. You’ll have the opportunity to contribute to my blog, social media and you’ll be the faces of all my 2019 marketing! It’s more than Senior Pictures. It’s a lifetime of memories and relationships captured. Class of 2019, you’re time is coming. Applications for the mSC open at 8am October 1 and close at 5pm October 31. The application is simply a way for me to learn a little about you before I invite you and a parent to the required parent meeting. I’ll have two parent meetings and you are required to attend one of those meetings and a parent must be with you. Why? Because your parents need to be included. They need to meet me and I need to meet them. They will trust me with you at events and sessions and they need to know what this is all about. Senior Pictures come and go, but memories like these last a lifetime. Find more information about the mSC at https://spark.adobe.com/page/5sO9znlYCiFTR/ and make sure to come back October 1 to get your application in. Do you know one of the girls in these images? They have been handing out “You’re Recruited” cards to their junior friends that they think would love to be a part of this. Ask them for a card and get access to the application early!